I’m not ‘cured’ of social anxiety. I spent the whole meeting in panic-management mode, with both hands pressed hard down on the table to stop them from shaking. But I’m grateful for this supposedly destructive condition, because it’s driven me – forced me – to earn a proper salary from the skills I learned as a blogger. I realised years ago that the Internet was going to save me from ‘conventional’ work, but it took me a very long time to understand how. I began blogging with high expectations, believing all sorts of nonsense about how it would convert into ‘income’. And I did quite quickly begin to build visitor traffic. But the money? That remained in extremely short supply. On-blog advertising did pay, but the amounts were very, very small. I’d generally need about half a million hits to earn £250. How long does it take the average blog to pull in half a million hits? 99% plus won’t do it in a month, let alone a week. And with social media referrals the ratio of earnings to hits would normally be much lower, so getting ‘big shares’ on Facebook or Twitter didn’t help much. After a while I realised that trying to make a living through typical ad programs was a lost cause, and I instead set about attempting to sell my skills as a copywriter. People had already been approaching me asking for my services, but none of them wanted to pay. Their logic is that you write your own blogs for free, so you’ll do the same for them, right?… Er, that’ll be a no. Some would talk money when pressed, but none would stretch to a respectable rate. Virtually everything you read about monetising blogging skills relates to a fruitless rat race. 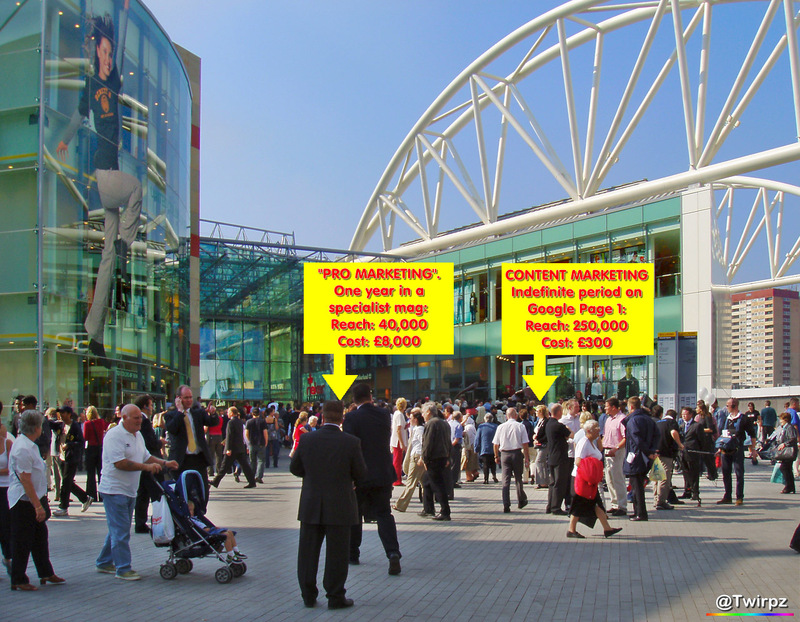 The rat race is naturally a very high visibility arena, because it’s actively promoted. It encompasses on-blog advertising programmes, freelancing connection sites, paid listicle or guest blogging sites – anything that’s specifically set up for you to make money on the Internet. In late spring, I took my skills to a local business. I’d reached a personal crisis and decided for the first time to fully acknowledge my social issues. I’d get medical advice (my first visit to a doctor in 12 years), and I’d communicate only on my own terms. I’d reject all of the social discomforts that had previously shut me down each time I’d started to succeed in the offline world. That felt like a very high-risk strategy, but so did everything else, including standing in a supermarket queue. What did I have to lose? My hope was that I could fuse the predictability and pay of regular employment, with the type of work I’d been doing online. I was going to persuade a business that it had a vacancy it didn’t even know existed. But it was after I got an insight into a local business’s ‘IT overheads’ that I really started to see how we, the online creatives, can prove a life-changing acquisition for a smaller company. There are B2B (business to business vendor) setups charging these small companies breathtaking sums for third party IT support packages, the entire contents of which can be found for free via Google searches. There are B2B setups who quote £100 per hour for adding a piece of YOUR text to YOUR website. Imagine that! Some of these B2B operations will even charge another £50 for the time it took them to carefully consider that request and provide the quote. Everywhere you look there are bundles and lock-ins. Complete rip-offs. A vendor has one offering of substance, and ten offerings no one will buy. What do they do? Lock it all together so smaller businesses are forced to pay for crap they don’t need in order to get the one commodity they desperately do want. It’s audacious. It’s ugly. But it works. Why does it work? Because the businesses paying through the nose for all this stuff don’t equate online creatives like us with the making or saving of money. Simply, they pay these exorbitant fees because they DON’T KNOW what an incredible amount some online creatives understand about the Internet. Thus, they have their needs furnished by whichever group of hard-nosed, B2B blaggers has been quickest to cold-call them. With these smaller businesses, your competition is not the million desperate bloggers who will write a 1,500-word article for fifty dollars or less. It’s the B2B bullshitters who swathe simple activities in mystique, and would actually charge more just to quote for a piece of content than a rat race blogger would receive for creating it. Needless to say, you can dismantle competition like this. It’s a foregone conclusion that, provided you prove you can do it, you will win the work. The number of businesses who are at the mercy of extortionate B2B operations is enormous. It’s time for us, the creatives who have for long existed in a world of exploitation, to find them. To leave behind the world that doesn’t need us, and enter the world that desperately does. 1. Steer clear of people who invite you to work for them before they’ve asked your rates. This is an absolute litmus test for assholes. If they’re not asking about your rates or your pay expectations from the off, THEY ARE NOT GOING TO PAY YOU PROPERLY. This is very common with people who approach you for content or ‘help’ unsolicited on the Internet. Almost none of them ask your rates or pay expectations, because fundamentally, they’re hoping you’ll do it for a namecheck and the ‘experience’. Or full-on gratis, because you happen to like the cut of their jib. Why, if you were expecting to pay someone, would you try to enlist their expertise without enquiring about its cost? Have you ever bought anything without first finding out the price? No, me neither. People who “hire before they enquire” are not customers; they’re scroungers. Don’t waste your time replying to them. 2. Aim to take yourself out of the freelance rat race altogether. Unless you’re very well known with a lot of online status, pretty much any consumer who knows the online freelance market is going to pay you exploitation rates. So there’s no point in going to freelance websites or approaching those who advertise for freelance writers. They know people will work for next to nothing. Why would they pay more? 3. Focus on businesses with limited Internet knowledge, because they’ll be impressed a lot more easily, and they won’t expect you to work for next to nothing. Why make life so hard when it can be this easy? Look for reputable businesses with mediocre, content-devoid websites, poor search presences, and no traction on social media. These are the businesses who get cold-called by B2B bullshitters, and you can easily beat their current packages for value, without working on the cheap. 4. Stay as local as you can. If you’re dealing with people on the other side of the world, you have immediate trust issues on both sides. You can’t recover unpaid bills from them, and they’re unlikely to trust you enough to pay you in advance. But local businesses know they can reach you, and that you can reach them. The mutual trust is naturally better, and it’s easier to build a relationship with someone who’s nearby. You can also offer a local business the benefit of your regional knowledge, which will help your content connect with local people. 6. Target businesses in high integrity fields. They’ll reward you more fairly, and if you’re good, respect you a lot more. Pay a lot of attention to the size of the business. Too small and they won’t be able to afford you even if they idealistically want you. Too big and you probably won’t be able to communicate with a decision-maker who can stray outside of a rigidly structured framework. Plus, big businesses will have more bases already covered, and you’ll probably get very little autonomy with your ideas. You’re straying back into the territory of making your life harder rather than easier. 7. Remember that your copywriting and creative skills can help a business with offline work too. You can write leaflets, newsletters, customer guide books, brochures, etc. Some businesses simply don’t consider that an online copywriter could handle these tasks more cost-effectively and creatively than a specialist company. If you’re a seasoned blogger, you’re likely to create a lot more impact with these applications than a regular Administrator, and you’ll probably do a significantly better job than the average Marketing Manager too. 8. If you know about web design and can do some coding, HEADLINE IT in your approach. A lot of businesses are at the mercy of very expensive third parties when it comes to the design and maintainance of their sites, and even the vendors who charge top whack can be very utilitarian and uninspiring, with a ‘bare minimum’ attitude. So if you can throw that sort of thing into your offerings within a salaried package you could really start to justify a good hourly rate. 9. Good at producing videos, images or other media content? Shout about that too. 10. Don’t underestimate your knowledge, but don’t overpitch it. Research and stress the applications for the abilities you do have, but admit your limitations. Don’t guarantee anything, and don’t tell a business you can achieve something you’re not 100% sure you can deliver. 11. Learn more. I know it’s hard work, but if you can expand on pure writing and head into other areas such as page design and functionality, you’ll become a much more attractive proposition. Ultimately, this is about making or saving people money. If you understand SEO, your written content can serve as free advertising, which will help boost sales and make money. But design and technical work can also save some businesses a fortune. If your skills can save a boss £thousands in one day, your job will be very secure. So, when am I going to deliver that web page which will save my own boss from forking out five digits to a cheesy sales dude?… Already done it. But Mr Cheesy’s market is there for the taking. All we need to do, is have the sense to drop out of our own world of exploitation, and find the people Mr Cheesy spends his time finding. And if you don’t do design or code, fear not. There are SEO businesses charging humungous fees for mystical optimisation plans – no guarantees. Once again, it’s all smoke and mirrors. This is 2016 – nearly 2017. SEO is all about content. We, the content creators, ARE search engine optimisation. We ARE the advert that never dies. So let’s stop pandering to people who expect our skills for free, wipe the smug grin off Mr Cheesy’s face, and appropriate his market. It’s not his property to sell, and it never was. Claim what’s yours, and do good businesses a big favour in the process.